Cement, iron, and steel come together to form the towering Heritage of Cebu Monument built right on the original Plaza Parian in Cebu City. Conceptualized by multi-awarded sculptor Eduardo Castrillo, the mammoth structure depicts significant moments in Cebu’s history beginning with that fateful fight of April 21, 1521 in the island of Mactan where native chieftain Lapu-Lapu killed Portuguese explorer Ferdinand Magellan. Devotion to the Señor Sto. Niño is one Cebuano trait depicted in the Heritage of Cebu Monument in Parian. 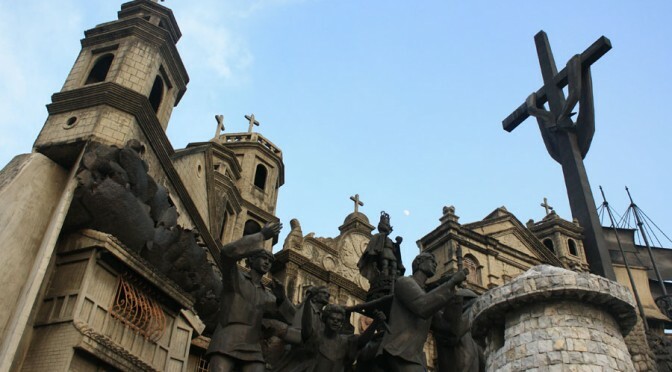 The monument also portrays as well the conversion of Rajah Humabon and his followers to Christianity, local revolution against Spanish rule, Cebuano veneration of Sto. Nino, and beatification of first Cebuano saint Pedro Calungsod. Construction of the structure began in July 1997; its inauguration was on December 8, 2000. Funding for the monument’s construction came from the late Senator Marcelo Fernan as well as private individuals and groups. Historical structures carved into the huge monolith are the Basilica del Santo Nino, Cebu Metropolitan Cathedral, San Juan Bautista Parish Church, Magellan’s Cross, and a Spanish Galleon. Also to be found in the monument are statues of the late president Sergio Osmena Sr. and Blessed Pedro Calungsod. The structure is in Parian, which got its name from the word “pari-pari” meaning to barter or trade, according to scholar and historian Resil Mojares. It was where the wealthy Chinese merchants of old lived and held lavish events. A few homes constructed during the 17th to 19th century remain standing today. It used to be that visitors could only view and take pictures of the monument from outside its fence. When we recently visited Parian, though, we were allowed inside the enclosure. The caretaker said they’ve opened the plaza to visitors and tourists. There is no fee for entering the plaza but donations for its upkeep are welcome. Spain's "gift" of Christianity to Cebuanos is depicted in this image of a Spanish priest celebrating mass with a huge cross as background. The Parian Heritage Monument is a short walk from Colon Street, Casa Gorordo, Yap-Sandiego ancestral home, and Jesuit house. It can be included in the itinerary of a visit to Cebu City’s historical Parian, home of the wealthy and influential Chinese mestizos during the Spanish period. The Heritage Monument of Cebu is 15-20 minutes by taxi from SM or Ayala and 10 minutes from Fuente Osmena.